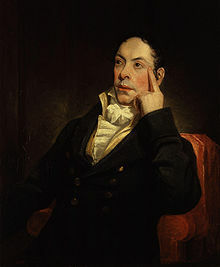 Matthew Gregory Lewis (July 9 1775 – May 17 1812) was an English novelist, poet, playwright, translator and Member of Parliament. His novel The Monk, written at the age of 19, was one of the most popular examples of Gothic fiction, and led to his being commonly known as Monk Lewis. Hark! hark! – What mean those yells – those cries? His chain some furious madman breaks! He comes! I see his glaring eyes! Now! now! my dungeon bars he shakes. Such screams to hear – such sights to see! I am not mad, but soon shall be. "The Captive"; cited from The Life and Correspondence of M. G. Lewis (London: Henry Colburn, 1839) vol. 1, pp. 239-40. And heaven will hear the orphan's prayer. "The Orphan's Prayer", line 29; cited from Titus Strong (ed.) The Common Reader (Greenfield, Mass. : Denio & Phelps, 1819) p. 174. Quotations are cited from Howard Anderson's edition (Oxford: Oxford University Press, 1990). For the 4th edition (1798), and some later ones, the title was changed to Ambrosio, or the Monk. An Author, whether good or bad, or between both, is an Animal whom every body is privileged to attack; For though All are not able to write Books, all conceive themselves able to judge them. Page 313; "Alonzo the Brave, and Fair Imogine", line 1. "Offensive to Love and to me! Shall Husband of Imogine be." Page 313; "Alonzo the Brave, and Fair Imogine", line 11. Page 315; "Alonzo the Brave, and Fair Imogine", line 59. Another Cleland see in Lewis rise. Why sleep the ministers of truth and law? Pandars to lust and licens'd blasphemy? Can senates hear without a kindred rage? Supply the laws, that wake not to restrain! Thomas James Mathias The Pursuits of Literature, revised edition (1797), Dialogue 4, line 316. Lord Byron English Bards and Scotch Reviewers (1809), line 273. He was a child, and a spoiled child, but a child of high imagination; and so he wasted himself on ghost-stories and German romances. Walter Scott, manuscript note written in 1825; cited from J. G. Lockhart The Life of Sir Walter Scott, Bart. (London: Adam and Charles Black, 1896) p. 81 col. 2. Matthew Lewis [was] the genre's first punk, the Johnny Rotten of the Gothic novel. Stephen King, in Matthew Lewis The Monk (New York: Oxford University Press, 2002) p. vi. This page was last edited on 16 July 2018, at 16:56.